In the popular imagination of large portions of the pundit class, Rick Perry is not only a popular Republican governor of Texas, but a legendary campaigner the likes of which the nation hasn’t seen for years. Here is a man, we’ve been told, who has never lost a single race, a person whose personal charm and keen political instincts had proven, time and again, irresistible to voters. But, a closer look at his history on the stump reveals that, while it’s true that Perry is undefeated in electoral contests, his mythic reputation isn’t entirely earned. Much of his hype is just that. And Texas, Tucker notes, “is an unusual electoral landscape”—which is to say it’s nearly empty. The Democratic Party in Texas is nearly nonexistent, and puts up only the most pro forma candidates. (“The Democrats are weak in ways that are not even indicated in the low numbers or poor electoral results,” says Jim Henson, director of the Texas Politics Project and a professor of Government at the University of Texas at Austin. “As an organization, the Democrats are just—I can’t even come up with a negative enough word.”) And judging from the low turnouts in the Republican primary elections—the only votes in Texas that really count for anything—even the ruling party in Texas is extremely dispirited. 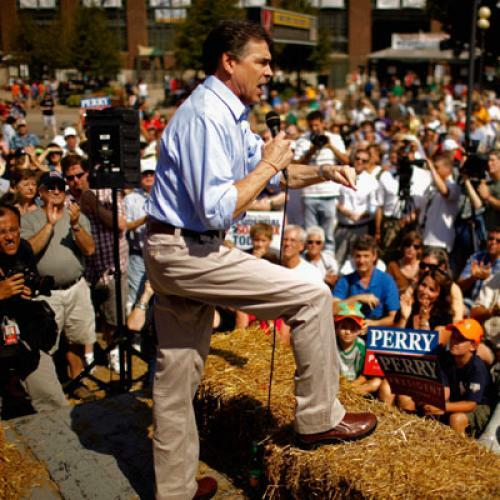 In the 2002, 2006, and 2010 votes in which Perry was elected governor, only around 4 percent of the voting-age population turned out for the Republican primary. As a result, Perry only needed to convince roughly 2 percent of the voting-age population of the Republican-heavy state that he would be a suitable governor before cruising through the general elections against a pro forma Democratic candidate, or, in 2006, a slate of nominal candidates. In Texas, the “people who vote in primary elections are unusual people,” Tucker stressed to me. “They are more extreme, further to the right.” In other words, Perry was able to repeatedly vault himself to the governorship largely not because he was a persuasive campaigner, but because he catered to the extreme views of a minority of die-hard conservatives. More generally, it’s impossible to ignore that Perry’s political persona was incubated in Texan political culture. “He campaigns with the Texas myth in mind, the myth of the Alamo, of the lone individual fighter for freedom standing against all odds,” explains Cal Jillson of Southern Methodist University’s political science department. “It’s the idea that government should be in the background… That most of life is to be left to individuals.” And, above all, Perry makes a big show of swearing his allegiance to the state of Texas. If anyone criticizes the state, “Perry will get a terribly pained look on his face and say, ‘you’re tearing down Texas. I love Texas, and everything about it, and all these criticisms just tear at my heart,’” explained Jillson, detailing a Perry specialty tactic. It’s not clear how much, if any, of this can translate to an effective presence on the national stage. Of course, blunt declarations of allegiance to Texas—or calls for secession—are unlikely to gain much traction in other parts of the country. Perry also has little experience appealing to the sorts of moderates he’ll need to sway in order to become president. And Barack Obama is a more formidable Democrat than any Perry has had to face in Texas. Finally, it doesn’t hurt that large swathes of the media are already swooning for Perry. “You’ve got a lot of people who wouldn’t vote for Rick Perry speaking admiringly of his campaign style,” explained Henson. The question remains, however, whether Perry has steeped himself in the Texas political game too thoroughly—and whether it will hurt his ability to effectively pivot to his new, national audience as a result. “The issue is, has he been in Texas politics too long?” Jillson asked. “Has he learned campaigning to the Texas myth so well that he can’t take himself beyond it?” Ultimately, if Perry believes the hype of his own undefeated streak, it will be his Republican challengers—and maybe President Obama—who stand to benefit. Gabriel Debenedetti is an intern at The New Republic.